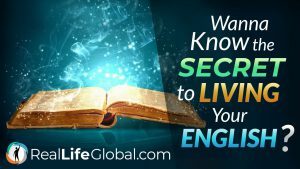 Wanna Know the Secret to Living Your English? Do you really want to know the key to unlocking1 your potential as an English Learner? Are you ready to truly live your English and take your life to the next level? Or are you content with being mediocre2? Here’s the truth. The secret to living your English is simple, yet few people will take the leap3 to face the difficult challenges along the journey. It takes courage, persistence, patience, faith, and gratitude. You have to take risks. You can’t be afraid to make mistakes. If this is you reading this…Congratulations! You are probably one of the brave few that have already accepted the Call to Adventure. You’ve started to step outside of your comfort zone, to face your fear of public speaking, and to meet people in English. As a result, you’ve seen a slight transformation, yet your English fears or inner “dragons” still haunt4 you. If you want to live your best life and level up your English, then create daily habits of learning and practicing English. Research shows success lies in the habits you form. If you want to live your English, then change your habits. They are the foundation for both your life and for your English. They are the weapons that you will carry with you along your journey to RealLife English fluency. You will use them to overcome obstacles5 and slay6 the dragons that stand in your path, so make sure they are sharp. It’s essential to refine them7 every day so that you can slice through8 challenges with less resistance. This article was inspired by James Clear’s interview with Lewis Howes, Success Habits: The Proven Way to Achieve Your Dreams on the School of Greatness , which we’ll share at the end of this article. If you are unfamiliar with James Clear, his mission is dedicated to using scientific research and studies of high-performing athletes, artists, and entrepreneurs, to help others improve their lives through their habits and rituals. By the end of the article, you will uncover the secret to not just learning English, but living it daily through your habits. You’ve probably heard that you are a result of the five people in your inner circle of friends, or “tribe”, that you spend the most time with. For that reason, it is important to be aware of your environment and the people that you surround yourself with. For example, if you would like to learn an instrument it would make sense9 to hang out10 with musicians. In this case, if you want to live your English, then you should find a way to hang out with native English speakers or other learners that are serious about practicing their English as much as possible. Make it a habit to meet English speakers in your city through Meetup groups, Couchsurfing, AirBnB, language exchanges, professional networking events, online language apps, English Facebook groups, and even dating apps like Tinder and Bumble. Find where the English speakers hang out and schedule time to go there each week. After a while, these people will become your best friends and a part of your tribe. Throughout the journey to RealLife English fluency, it helps to surround yourself with a tribe of like-minded English learners and mentors. Your tribe will support your growth by giving you a safe space to make mistakes and receive feedback11 without too much judgement. Do you have difficulties finding a supportive community of global English learners to practice English and connect with? Learn more about our Native Immersion Course that will give you a lifetime, unlimited access to our RealLife Fluency Circle Group, where you will be able to share your ideas and live your English with people from all over the world. James Clear says that one of the principle steps to forming new habits is to “master the art of showing up13” and make it “frictionless”. In this case, he is explaining that you should try to make the new habit that you are trying to form as easy as possible to do every single day, even if it means just doing it for two minutes each day. Instead of trying to start off with big expectations for yourself, start small with a habit that you can easily achieve, and increase its intensity only after the habit is formed. In the interview, James uses exercise as an example for his “Two Minute Rule”. If you want to make running a habit, start by waking up each morning, putting your shoes on, and taking one step out the door. Just spend two minutes starting the desired habit. Eventually, you will realize that you are already outside and will start to explore your neighborhood by walking around. Sooner or later that walk will become a jog as you increase the intensity, but only after you form the habit of getting up and out the door. The same applies to living your English. If you want to make writing English a habit, keep a journal next to your bed and write three things you are grateful for every day when you wake up. Do you struggle to form the habit of reading in English? Keep a book with you wherever you go, and just start by reading one page per day when you are bored instead of checking your phone. Do you want to form the habit of facing your fear of speaking English in public? Every morning send a short voice or video message to an English speaking friend before you have breakfast and start the day. The tiny, good habits that you create on a daily basis will eventually add up to have a significant impact on your English abilities. Be curious along your journey to RealLife English fluency. Try to create habits that can be easily incorporated14 into your daily routine in a fun, natural, and convenient way. If you are ready to live your English, discover a few essential tips to make English a permanent part of your life. Make it harder for you to practice the bad habit and reduce exposure to whatever is causing that habit. In this day and age, there are a few obvious items that distract us on a daily basis as much as cell phones, social media apps, and TV. For example, if your cell phone is a distraction at work, then put it in another room while you focus on the task that you need to complete. If you are easily distracted by social media apps such as Facebook, Instagram, or WhatsApp, then make it as hard as possible to use the app. Hide it away from your home screen, only use the desktop version16 on your computer, and turn off notifications. Do you want to live your English? Then your bad habit most likely involves doing things in your native language that you know you could do in English. On the weekends, make plans to hang out with your English speaking friends so that you can practice. Do you sometimes speak to foreign friends in your city in your native language? Instead, make the conscious decision to only speak to them in English no matter what. Let them know your intention17 to improve your English, and surely they will be supportive of your effort to speak English with them. Are you a fan of chilling18 at home and watching Netflix? Then, make sure to turn your Netflix language settings to English. TV series and movies are a great resource to use to practice English on a daily basis. They use a lot of the idiomatic expressions and cultural references from English speaking countries. If you enjoy living your English with TV series and movies, make sure you subscribe to our YouTube channel Learn English with TV Series so you don’t miss out on the chance to level up your English with weekly lessons containing amazing tips to improve your vocabulary, grammar, and pronunciation. The final step to living your English may be the most important one. Once you’ve found your tribe, started to make good habits frictionless, and bad habits invisible, remember to relax and have some fun with your English again. Schedule time each day to do things that you love to do in English. Follow your bliss, and do things that make you feel happy. Sing along and dance to your favorite songs while you are in the shower. Watch a TED Talk during breakfast, and learn something new. Listen to your favorite podcast, and see if you can keep up with19 the pace20 of interesting conversations between native speakers. Wake up and do a guided meditation or have a yoga session in English to start your day. You are the hero of your own story. Decide how you want to live your English. The journey to RealLife English fluency is a marathon, not a sprint. Along it you will face a number of challenges. Each day is an opportunity to sharpen your sword with your habits and prepare for battle against your inner dragons. Day by day as you form the habit of practicing your English, you will improve your abilities and unlock the superpower of connecting with English speakers across the world. Watch Lewis Howes’ interview with James Clear if you are interested in learning more about how to make anything a habit. Wow this post was great. Thank you so much, Zach! Ameizing! Keep them coming ? Great article Zach, It’s jam-packed with useful pieces of advice !